In the confluence of events that is the reading life, the fate and experience of children is much on my mind this morning, and the thoughts are enhanced by feeling a particularly deep longing to stroke my grandson’s silky cheek and hear my son’s laughter. 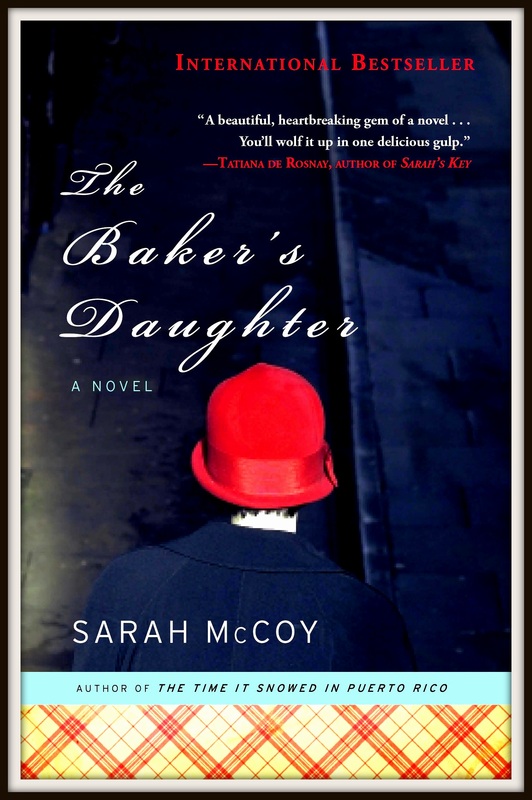 Today I’m reading The Baker’s Daughter, by Sarah McCoy, another in a long list of summer books (The Sandcastle Girls, The Chaperone, The Shoemaker’s Wife) that astound me with their perfectly expressed sense of time, place, and truth. Traveling between present day and Nazi Germany, McCoy invites us to reflect on the cost of what happens when good people do nothing, and when the cost to the individual finally becomes too high to bear. One of the young women in this novel is involved in the Lebensborn Program, established by Himmler in 1935 for widowed or unmarried women who had become pregnant through their association with SS officers. Seen as a way to expand the best attributes of the Aryan race, there were strict provisions for the mothers involved. As the Nazi eugenic program expanded, so did Lebensborn, until there were numerous “homes” throughout Germany, Norway, and Sweden. It is believed that the program evolved into a “breeding ground” for young women who were impregnated by SS officers and their children adopted out in an effort to ensure the future of the Aryan race. Somehow, in all the reading I’ve done over the past 50 years, I’d never heard of this “program” before. Or if I had, I had blocked it from my mind because the thought was so horrible to contemplate. In McCoy’s novel, one of the infant children (a boy) is deemed “not quality,” and is taken away and ostensibly adopted out of the country. However, his mother later hears rumors that such “rejects” are actually poisoned and their bodies burned to eradicate any trace of an “imperfect” specimen. I am still astonished at the cruelties human beings can perpetuate on one another in the name of misguided principle. So I read this after spending some time talking this weekend with friends who are parents and teacher, people who are all concerned about the fate of children in 21st century American where the pressures to excel and achieve seem to outweigh the need for personal responsibility or the desire to live a decent life of simple happiness and ordinary human goodness. We must learn to value our children, not simply as conduits to fulfill our personal dreams, commodities to ensure our future, or examples of a pure nationality, but as human beings with the universal and lifelong need to be loved and cherished and whose well being depends not on how much money they make but on how much satisfaction they attain from their work, their relationships, their self image, and their place in the world. Now I wish I could go and hug my children, large and small. When I was little, it was the glossy pages that appealed to me. And the smell -perhaps I should call it the aroma, because that sounds so much sweeter – and the aroma of fresh ink on smooth glossy paper is sweet indeed. So I sort of understand the mystique Travis Kurkowski is writing about in his essay (Dreaming about the Past: Is Online Publishing Permanent Enough?, Creative Nonfiction, Spring 2012), which discusses whether online publishing (i.e., blogging) is as satisfying as print publication (i.e., magazines/journals). I’ve been pondering the differences between the two, knowing for sure there are differences. Not that one is bad and the other is good – no such thing at all. Reading blogs for me is like shopping at art fairs. I meander all around first and then maybe I’ll go back to some of the more interesting booths and poke around in the jewelry or photography or hand-painted tiles with cute sayings on them. I never spend more than a few minutes, because most everything I need to see is right there within the tiny square footage of the artist’s tent. Perhaps the artist is hovering around, and we exchange a few words (a “comment”). But magazines – at least the ones I regularly read – require more lengthy perusal. I fold my Newsweek in half and tuck it into my oversized purse to read while I linger over coffee at Panera, or to pass the time between classes when I’m accompanying at the middle school. During the summer, I keep a basket for magazines under my comfy chair on the back porch, and sometimes spend a hour with a glass of iced tea and an essay or short story from The Sun. I save up the More and Oprah magazines for plane rides, because they occupy me for the whole of those times when electronic devices are not permitted and provide just enough distraction from the noisy, cramped quarters. Occasionally I might underline a particularly interesting sentence or passage. Save one to pass along to a friend. Tear out a page I want to keep in my idea file. These are things you can do with magazines. I think what Kurkowski is trying to remind us of is that print has a sense of permanence while digital is transient. Once those words are placed on the magazine page, they aren’t going anywhere. But online content can be eradicated from existence with the ease of an administrator’s key stroke. Online publishing is certainly here to stay, and I’m glad about it. I enjoy my daily forays through the art fairs of the digital world. But I still like the feel of those glossy pages under my fingers, the stunning photos in living color, and the sweet aroma of printer’s ink. How about you? Do you think there’s an important difference between online periodicals and print? Despite the heat, we’re managing to maintain our summer routine chéz Ravenous Reader. And that’s a good thing, because I do very well with routines. I am as much a creature of habit as my two little dogs, and when the apple cart of my regular schedule gets upset, my mood quickly goes a-kilter too. Am I imagining it, or are my routines becoming even more important as I get older? 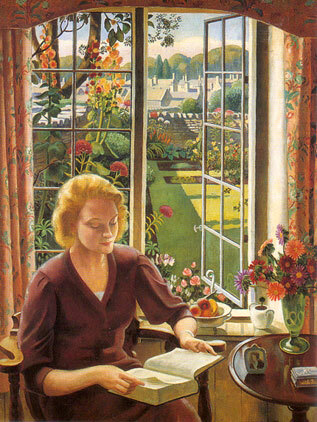 It seems harder to recover on those days when I have to get up early and thus miss my morning coffee-and-a-book hour. And if there’s not time to get my usual two mile walk in, I feel sluggish and out of sorts. Earlier this month I was reading Anna Quindlen’s new book, Lots of Candles, Plenty of Cake. In it she talks about her morning routine, so I was happy to know I’m not the only one who thrives on starting the day with a familiar pattern. This is how the days begin for me now: I rise at 6:00 a.m., which would have been as improbable to my younger self, who would roll over and go back to sleep with unconsidered ease, as would those evening when I think idly, Is nine-thirty too early to go to bed? (No.) I go down to the kitchen, make enough coffee for several people even though I am the only one who drinks it, make the same breakfast every morning, either Greek yogurt with a little granola blended in or a whole-grain bread with almond butter. I read the paper and do the New York Times crossword puzzle. Then I power walk for an hour, almost exactly four miles, either in Riverside Park on on a hilly look at the house in the country. Upsetting the opposite end of the day has the same ill effects as a messed up morning. I like to watch about an hour’s worth of tv before bed, something frothy and fun, or a good family drama. During the summer when all my favorite shows are on hiatus or in reruns, I sometimes don’t have those choice. I don’t do well with reading at night – not before I intend to go to sleep anyway. I’ve conditioned myself to fall asleep with a book at night, so I’d better be in bed and ready before I start to read. It’s all about conditioning, our regular routines. We find pleasant ways to start and end the day, and it’s comforting to have those rituals to look forward too. Luckily, today was a typical Tuesday. I got up at 7:00 a.m., made the coffee, and went out to the back porch with my book (The Book Lover, by Maryann McFadden). It was hot, but bearable, and I drank both cups out there happily reading with the birds wake up chatter for background music. I had my 30 minute exercise routine in front of the televsion (and underneath the ceiling fan), then walked the dogs on a shady and abbreviated (because the temperature was already 88) version of their morning constitutional. After all this I have breakfast, which is always the same, too. Whole grain toast with peanut butter, banana and some other fruit (today it was melon) and orange juice. So the day got off to a good start. Typical, uneventful, and just how I like it. How about you? Do you have typical and comforting ways to start and end your day? Rarely have I read so many good books in a row as I’ve read this summer. Lots of Candles, Plenty of Cake. Today, I’m adding The Chaperone to that list. I loved this story of a Wichita matron in the 1920’s who spends a summer in New York chaperoning a young Louise Brooks (who became a star of silent movies). But the book is really Cora Carlisle’s, a woman with an unfolding story far more complex than I ever imagined when we first meet her in her corsets and high necked dress. And Laura Moriarty unfolds that story in such a masterful way, pulling the reader in and making you long for more on every page. I finished it this morning, and haven’t yet chosen my next selection. I was excited to receive a copy of The Baker’s Daughter in the mail on Monday. I’ve been wanting to read this, and may choose it next. You have to be careful after reading a book you really love, don’t you? It’s so easy for things to fall flat. In other bookish news, the airwaves were all a-twitter with some wonderful news for two of my favorite authors. Beth Kephart’s newest book, Small Damages, received a shining review in The New York Times this week, and was listed (along with Chris Bohjalian’s The Sandcastle Girls) as one of Publisher’s Weekly best books of the week. I was vicariously thrilled for both of them, and it was also great fun to see Twitter and Facebook streams suddenly light up with people passing these accolades around. Sort of the cyber equivalent of tossing confetti and toasting with champagne. So, here’s you you, Beth and Chris. Thank you for sharing your wonderful words with all the rest of us. Life is messy. But Natalie Serber’s collection of short stories, Shout Her Lovely Name, bravely delves right into the messy lives of family relationships, particularly those of mothers and daughters, and exposes them with empathy and affection. In addition to being linked thematically, several of the stories follow the lives of the same characters, Ruby and her daughter Nora. We meet Ruby as a child, see her grow to adulthood and become a mother, and then watch the cycle occur again in Nora’s tumultuous life. The stories all reveal the characters ache for connection, as they explore their uneven and sometimes desperate attempts to achieve it. Serber’s writing is sharp and sometimes acerbic. 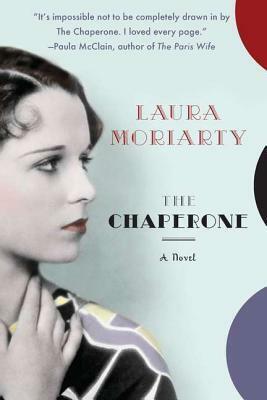 She marvelously captures every era, from the 1970’s to the present, and places the reader squarely into each place. I don’t often read short story collections, but I enjoyed the way these were linked both in theme and in character, making them read almost like a novel. Now, facing “the empty nest,” she has released another bird into the sky – this interesting and well written collection of stories about motherhood. A fitting debut, I think, and one that should soar. I have a copy of this collection to give away. If you would like a copy of this book, leave a comment below. A winner will be chosen at random on Sunday, July 15, 2012.